Virtual Images has the most experienced team of designers in the industry, with over 15 years experience in designing for lenticular. We combine technical and artistic expertise to help our customers make the best use of lenticular printing. 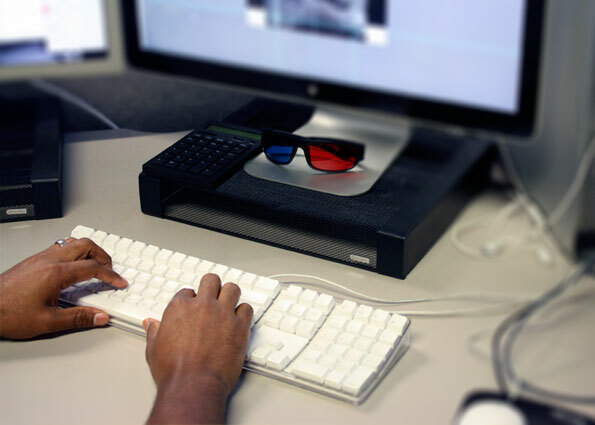 In-depth knowledge of lenses and production processes, and the use of digital halftone proofing allow us to provide the most accurate prototypes in the industry. Compositions with lots of layers and a good depth of field work best for 3D lenticular design. Generally speaking, primary design elements that need to remain crisp and in focus will be at "lens plane" in 3D. Build layouts with lots of background and foreground elements that can be used to add depth to your piece without sacrificing the clarity of critical message elements. Try to avoid using lots of solid colors and line art. 3D lenticular works best in busy images with lots of texture! There is no maximum to the number of layers in your Photoshop file, but make sure everything is properly separated. View our video on how to set up your files for 3D lenticular. Avoid flipping highly contrasting images, or flipping over a white or light background. This will result in an undesirable ghosting effect, where the "off" image can still be seen within the "on" image. A light background may be used if the flipping elements stay in one location so that the first phase of animation covers the second phase. Try to set up similar elements in each phase of a flip so that they align with elements in the alternate phase. i.e. align eyes and facial features if flipping between faces, keep text elements in the same position, using similar fonts and colors, etc. The more flips you incorporate in a design, the less movement is required to see each phase of the flip. For most projects 2 or 3 phases are effective, 4 or more start to be difficult to see clearly. View our video on how to best set up your files for a lenticular flip. Zooms view best as up/down animations (lenticules run horizontally). Zoom lenticular animations can consist of type and/or graphics that change size, spin, or move in any combination. Optimum Zoom animations work better when the background is a cool darker color with the zooming element a lighter and warmer color than the background. It is not necessary to supply all of the "in-between" images of a zoom. The beginning and end phases are usually sufficient. The most effective Morphs use images with similar shapes, such as one person changing to another person, although it is possible to morph any two images. Morph lenticular animations work best when the background is constant and does not change. Morph animations work best if the morph effect occurs in a stationary location. Sharp, clear images are needed for smooth animations. It is not necessary to supply all of the "in-between" images of a morph. The beginning and end phases are usually sufficient. Multi-phase lenticular is typically animation with more than 3 images. The number of different phases that can be used will be determined by the lens on which the job will be printing as well as the art itself. Please consult with your Project Manager or Salesperson. Photographs and illustrations depicting sequential actions will work extremely well, and often allow the use of more frames than animations using disparate images. Multi-phase animations work best if the background is static and action happens without zooming or panning. Simple animations are often-times the most effective. The "keep-it-simple" rule applies. Avoid animating highly contrasting images, or animating over a white or light background. This may result in an undesirable ghosting effect, where the "off" images can still be seen within the "on" image. A light background may be used if the animating elements stay in one location so that each phase of animation covers the prior phase. Full Motion Video is essentially a Multi-phase lenticular design with the source art coming from video. HD video (1080p) is strongly recommended for the best results. The higher resolution, the cleaner the lenticular image. The number of different video frames that can be used will be determined by the lens on which the job will be printing, as well as the nature of the video itself. Because each FMV lenticular project is unique, we ask that you send us a Quicktime movie of the proposed animation. Our Lenticular artists will then be able to make recommendations. FMV animations work best if the background is static and action happens without zooming or panning. It is best if the motion is centered throughout the series of frames. Simple animations are often-times the most effective. The "keep-it-simple" rule applies. View our video on how to set up your files for video and animation lenticular effects. Files for 3D, flip, multi-phase, and combination effects should be supplied as layered Photoshop or Illustrator files at 300 ppi in CMYK. Full Motion Video files should be supplied as HD Quicktime (1080p). Supply color proof for matching if color is critical. 3DsMax and Cinema4D also supported. Supply files at full size, at 300 ppi, with .25" bleed on all sides. For 3D, supply .5" bleed on the left and right sides of the image. Text under 10 pt, thin lines and rules, and other very small objects may break up or look jagged under lenticular lens. For flips and multiphase, supply a layered PSD or AI file with layers or layer sets for each phase of effect. For 3D provide as many layers as possible.